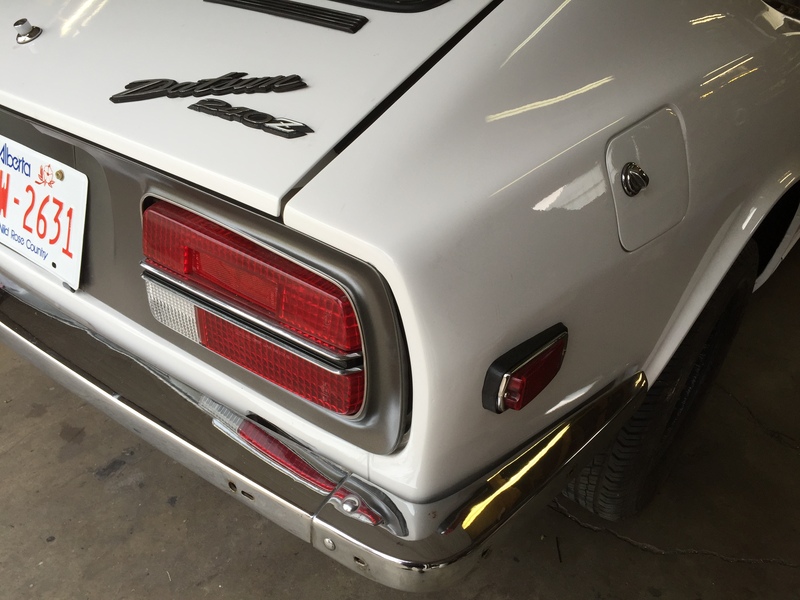 I've been working on a 12/70 (VIN 17813) restoration for about 10 months. It will be ready for sale shortly. I have been making vague references to this project in a few posts over the last few months, hoping to wet your appetite. I do feel strongly about the adage of "it should go to a good home and to good people" so I'm starting here. This is the only place it is currently advertised. I will keep this true for at least seven days. Here are a few details and pics to get your juices running. White on blue. Series 1. fresh single stage paint. Only minor rust was present and is all fixed. Standard disclaimer about there being "no such thing as a rust free Datsun". Lets get this out of the way now. Fresh L24 with an E31 head, but the block is NOT numbers matching. There. I said it. what a relief to get that off my chest. 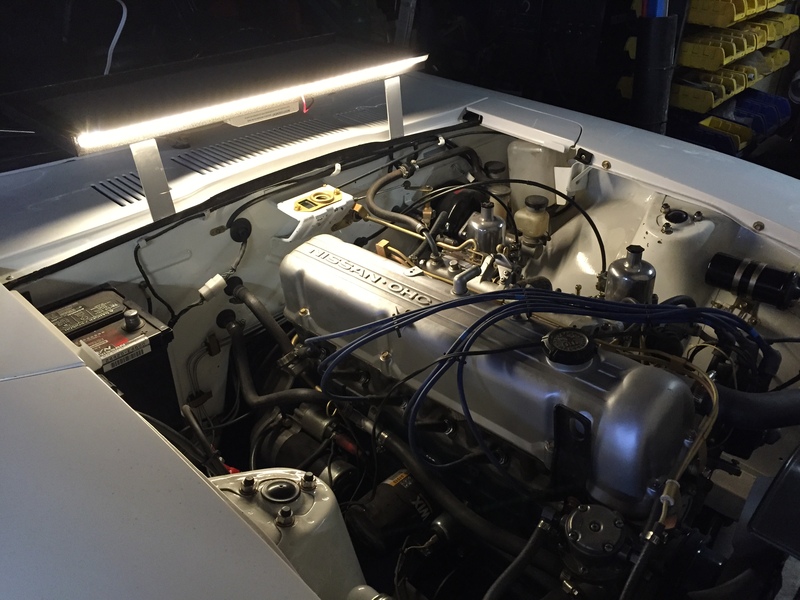 It is done primarily as a stock restoration but it has several small and tasteful upgrades and many important and common "Standard" improvements. Nothing that can't be easily reversed if you want to go "pure". It's not perfect. I built it as a driver, not a show car or medallion winner. There are lots of things you can still buy, clean perfectly, or improve on yourself to make it "more better" and "yours". I've take hundreds of pictures of pretty much everything that's been done to it. No secrets. There have been a couple of white on blue series 1's that have been offered in the last year that sold in the $20-25K USD range if you're wondering what I'm asking. Recent discussions by members of this forum of similar cars for sale, make this a very reasonable range to expect. I'm flexible but not like when I was 12. I want it sold sooner than later. There is still time to finish it to a buyers specification if the engine, trans, wheels, whatever are not right for you. How often do you get that offer from a seller? I will happily discuss the details with any of you that want the full story. PM me for a phone number. Comes with its own "Cowl mounted LED lit tool tray" if one of "you" buy it! 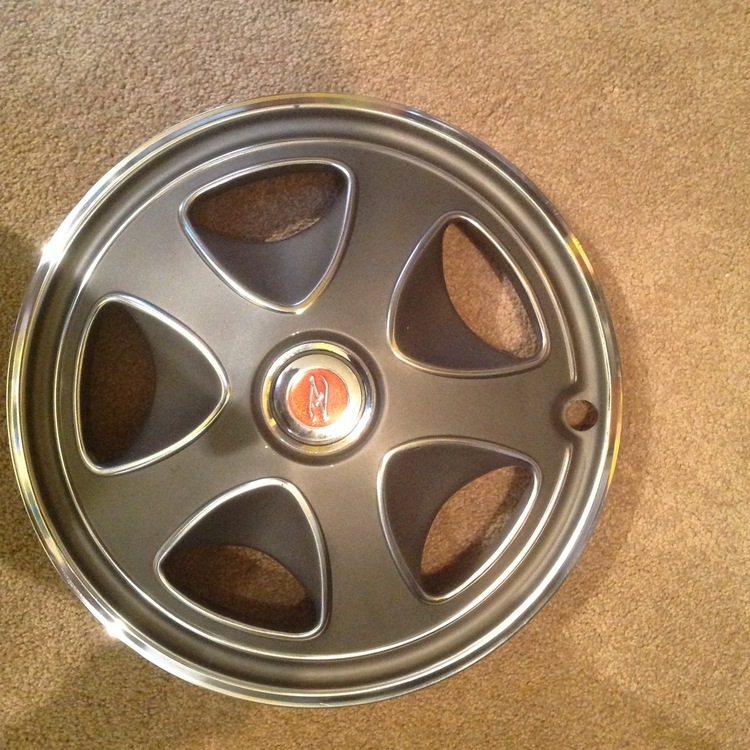 Four nearly perfect "Z" hub caps to go on the nearly perfect 14x5 stock rims. I know, I know.... Don't start. I have 4 14x6 aluminum slot mags you can have if this is too "Wrong"
Yeah- looks good . Feel free to post more pics . Like to see that blue interior. Blue pictures coming tomorrow. Not pictures of Blue though. A friend just sent me this link from Bring a Trailer. 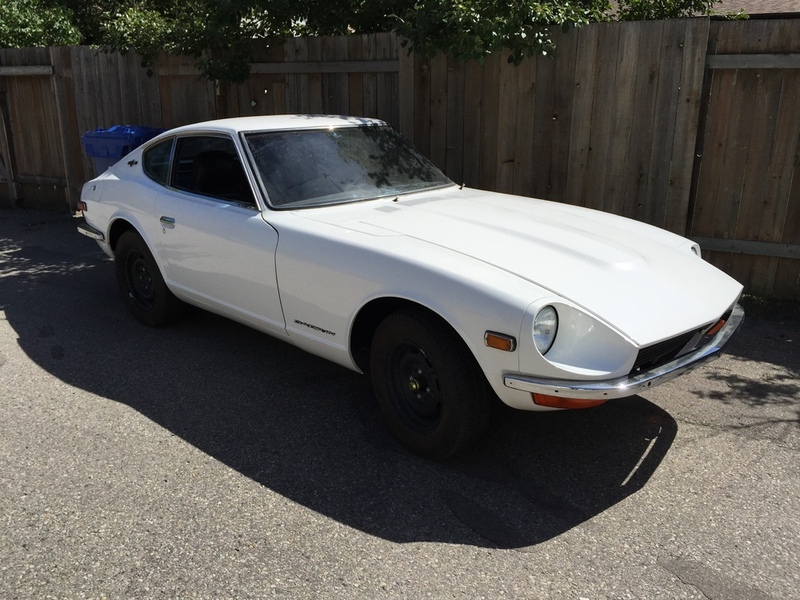 And another high is set for a 240Z sale. $27,750 !!!! 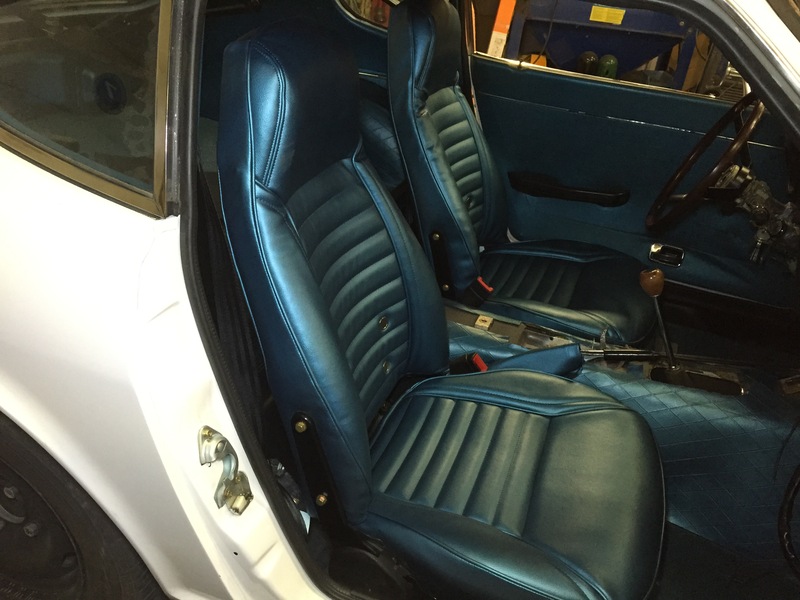 Now about the blue interior and some pictures. Truth is I'm just putting the new blue seat covers on the seats. The rest of the blue interior parts are in place, but with the black seats, no matter how new and pretty, it just kinda spoils it. 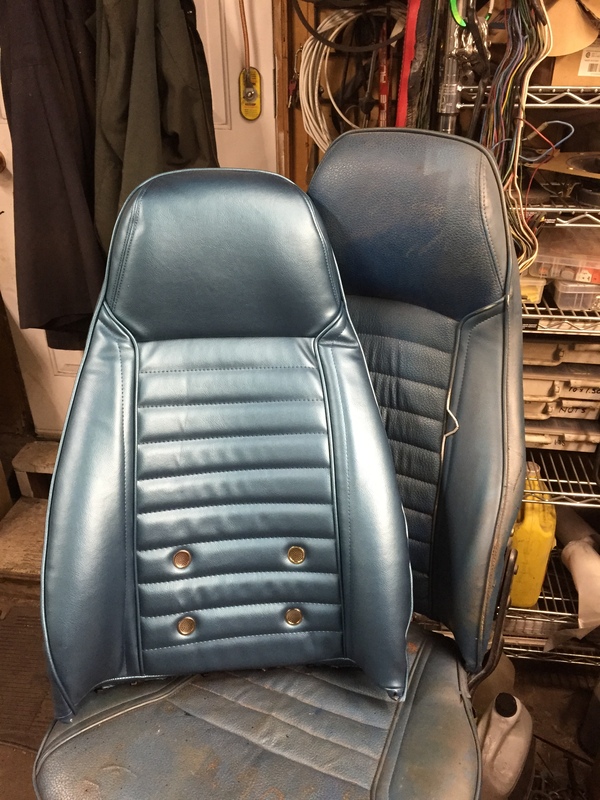 I have a whole new respect for upholstry people after struggling on the first seat cover. Second one will be easier. Skin about to go on the foam. Note I'm working on the original blue seat that now functions as a shop seat and workbench. Very handy for unholstry work too! 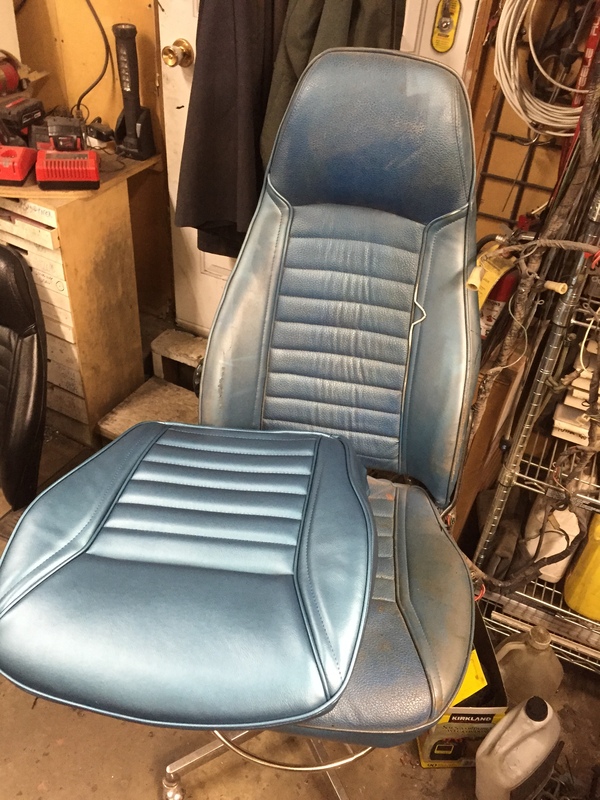 The black seat back waiting to be stripped, and new base with blue. Old and new. The new material is much thicker stock than the old. Nice and stiff in the cold out in the shop today. 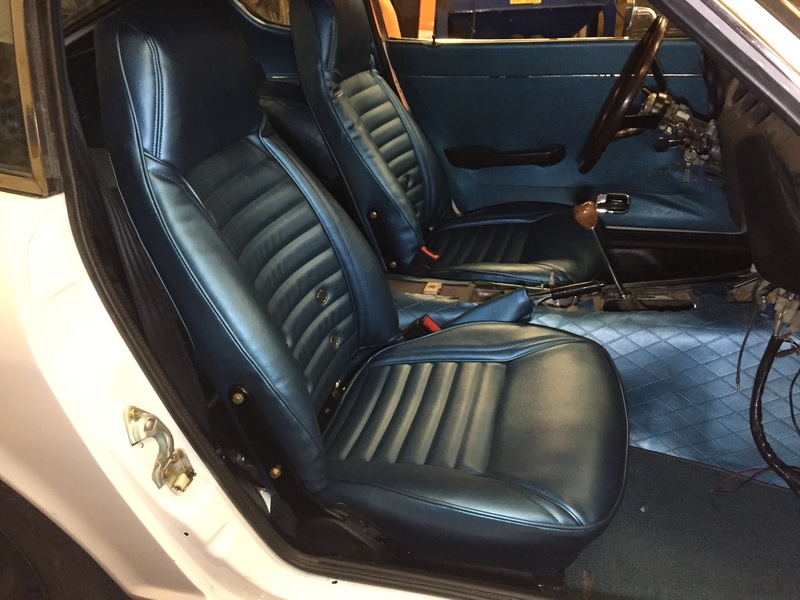 Some other blue interior pics. 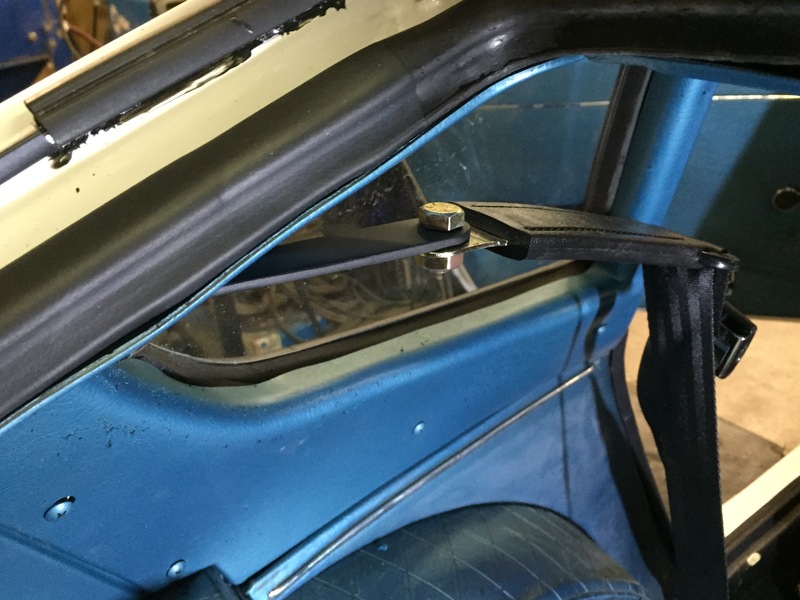 These were taken around my most recent new modern seat belt upgrade and how to do it properly in a series 1, oops I mean early Z with plastic behind the seat tool covers. It deserves it's own thread. 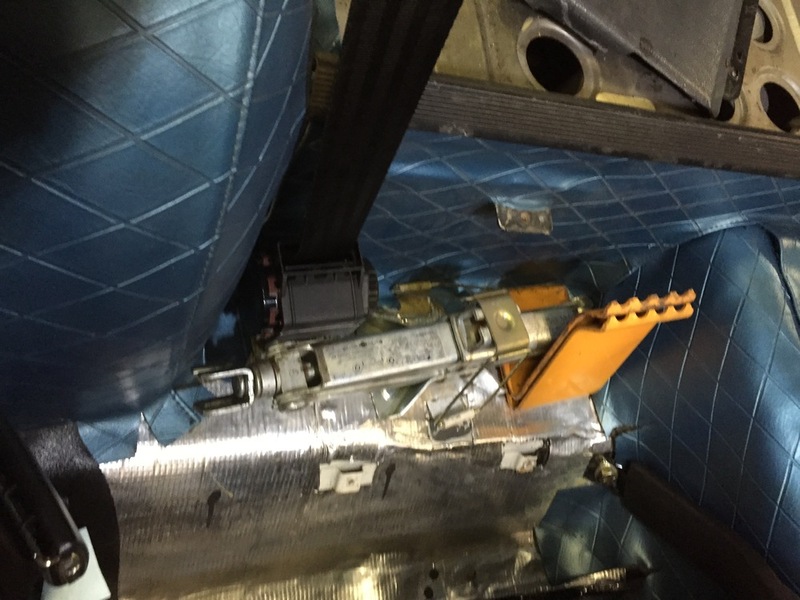 Here the retractor reel fits right in the corner and still has room for the jack and wheel chocks. 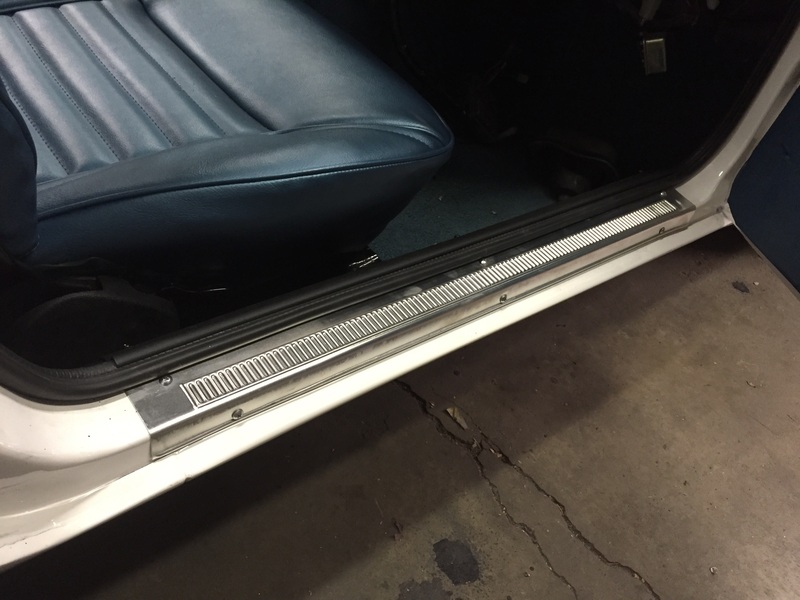 yes you have take a corner out of the cover to let the belt come thru. This is the shoulder belt extension that puts the pivot point loop just behind the drivers shoulder and puts the down going belt going straight down into the reel as its supposed to. Fine looking lathe in the background there, Jim. Details? Jim, I might need to drive down to Calgary now... drool...! Great looking car! I hope it goes local. Would love to see it in person, or better yet, in my garage! Lathe and a milling machine! Okay you bunch of crows, focus on the pretty white thing in the middle of the shop, not the shiny stuff all around. Weeeee, you're welcome to drop in anytime. Love to show you around. 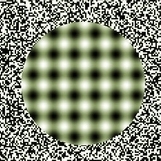 It goes round and round. Nothing special, its an asian "value priced" thing from Busy Bee tools here in Calgary. Wouldn't buy another one. Does the little things I need around here. I bought the seat covers from MSA. 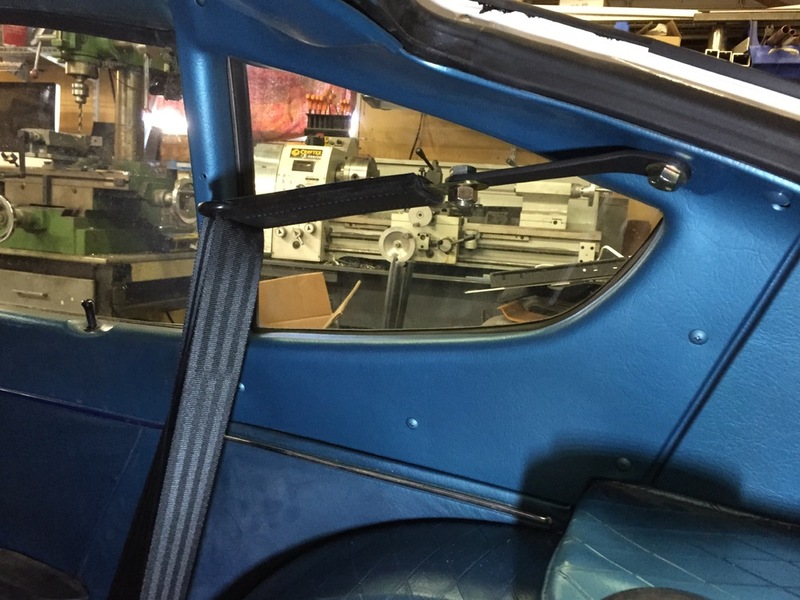 The interior panels are all original re-dyed, except the tail light panel and one quarter window cover. 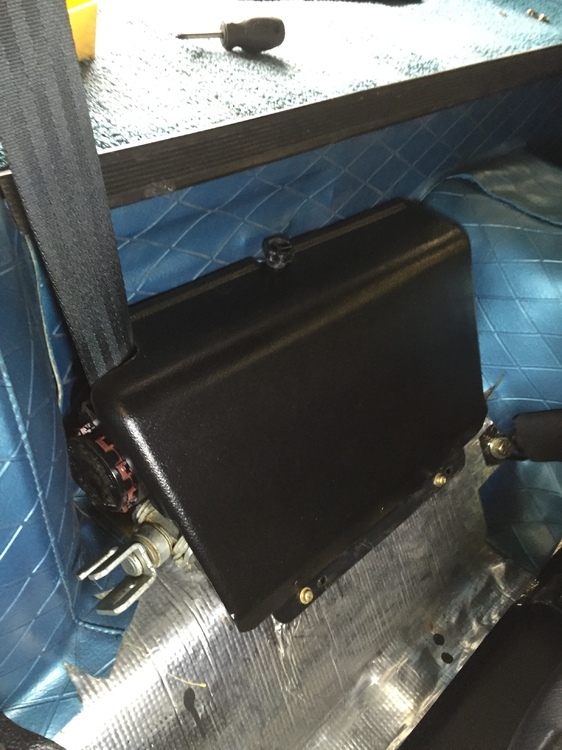 Just finished wrestling the seat covers on the drivers seat. Now all four pieces are done. May I again thank all the upholsterers out there for their service. And the inventor of the zip tie. 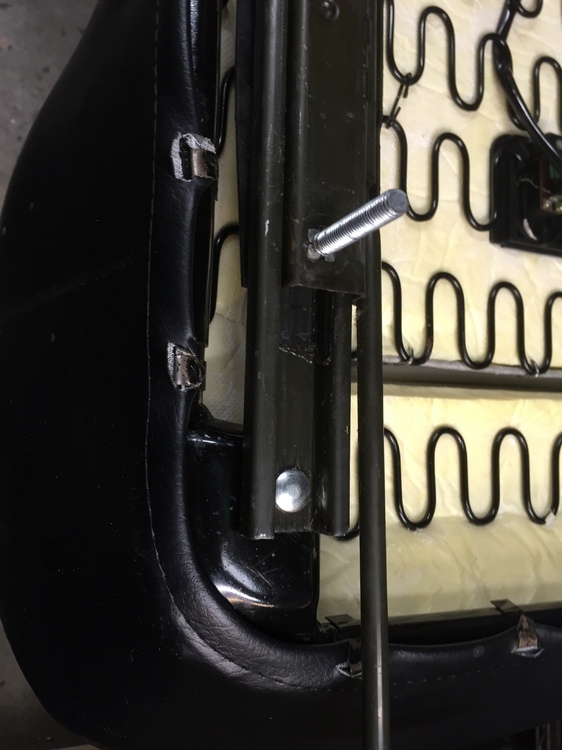 Without those things to pull the back rest upholstry ends together, and a heat gun to soften that thick vinyl, I'd be a basket case. Will have them back in the car soon and pictures coming this aft. P.S. I'll also have a like new set of black seat covers just laying around if anyone would like them... I am NOT installing them for you. May I again thank all the upholsterers out there for their service. And the inventor of the zip tie. 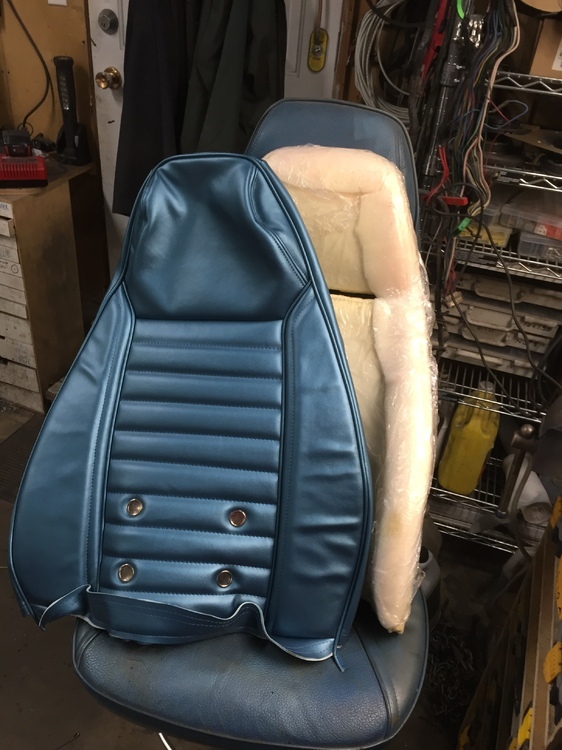 Without those things to pull the back rest upholstry ends together, and a heat gun to soften that thick vinyl, I'd be a basket case. 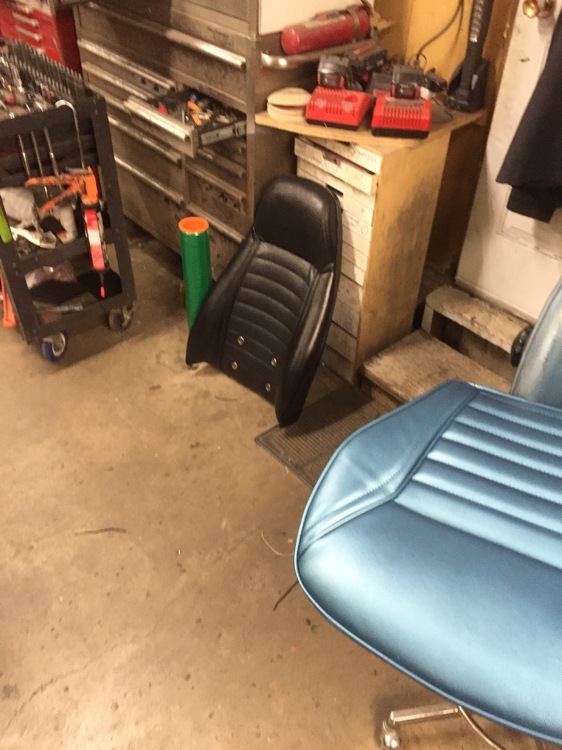 As a veteran of the seat restoration club, I can 100% relate to that! Jim - sweet car. Very nice work ! There. I'm black and blue and so is the car. Nice air compressor I see reflected in the quarter window trim!!!! Automotive voyeurism demonstrated at its finest! Let's see what you can spot in the threshold strip shine.